The history of Brazilian Jiu Jitsu can be better understood by looking back to feudal Japan. Samurai warriors developed many systems of jujutsu (gentle art), which were hand to hand combat systems that were used on the battlefield in times of war. Many styles existed, and were often unique from family to family. Jujutsu utilized joint locks, chokes, throws and ground fighting techniques to subdue an armed attacker. This was due to the fact that kicks and hand strikes were of little use when fighting a fully armed opponent. This was life or death, but jujutsu master Jigoro Kano wanted to combine the best of jujutsu into a practical form of exercise and self defense. In the late 1800’s Kano created Judo (gentle way). It should be noted that this occured during a critical time in Japan’s history-the Meiji Restoration. The introduction of the gun into eastern culture drastically changed the lifestyle of feudal Japan. The sword was phased out, and all battlefield arts were transformed into “ways of”. Here is a breakdown of the transformation that occured. Judo was formed from the harder throws, pins, and ground grappling techniques of the various aikijujutsu styles. In the 1900’s Judo was exported to Brazil. 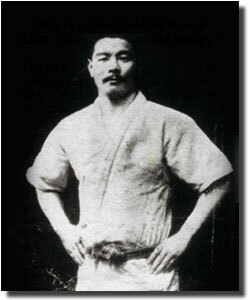 Mitsuyo Maeda, or Count Koma as he was better known, instructed the Gracie family in Judo. Carlos and Helio were quick to learn. However, Helio was a frail individual, so he modified the techniques of Maeda’s Judo, making them more applicable for a smaller, weaker person. These modifications gave way to the art form that we know today. Interestingly, the name Judo was not adopted, perhaps because of the fact that many “Judo” practitioners simply referred to the art as Kano Jujutsu. The name Jujutsu, or Jiu-Jitsu (Jiu-Jitsu is simply the common spelling in Brazil and many European countries, some systems of American and Japanese origin may use Jujitsu) was kept since the techniques were practiced with emphasis on combat, and not oriented around sport or recreation. The streets of Brazil were rough to say the least, and many times members of the Gracie family were pushed to prove their art in real street fights. This was tough but true. The techniques were refined even further, making a fighting form like no other. For several years, Kodokan Judo reigned supreme. All subsequent challengers representing traditional styles were defeated, and the superiority of Kodokan Judo appeared unassailable. Then, about the turn of the Nineteenth Century a monumental event occurred when the Kodokan was challenged by a man named Mataemon Tanabe. Tanabe was the headmaster of an obscure system of classical Jujutsu, the Fusen Ryu. The Fusen Ryu was unlike the other Jujutsu styles that had sought to test their techniques against the Kodokan; Fusen Ryu fighters were expert at fighting on the ground, an area conspicuously lacking in the Kodokan syllabus of technique (up to this point in its evolution, Judo techniques were almost entirely composed of stand up throwing methods). In the matches that followed, all representatives of Kodokan Judo were taken to the ground and submitted by the fighters of the Fusen Ryu. The results of the Kodokan-Fusen Ryu matches highlighted the relevance and importance of ground fighting techniques in dramatic fashion, and Kano invited Tanabe to teach ground grappling at the Kodokan. Ground fighting became very popular at the Kodokan, and all students began practicing both throwing and ground grappling techniques. At about the time the grappling techniques of the Fusen Ryu entered the Kodokan curriculum, a young man named Mitsuyo Maeda began his Judo training. 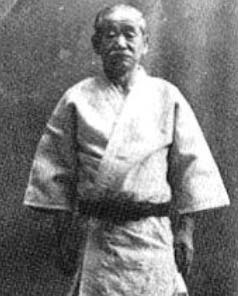 Mitsuyo Maeda greatly taught Judo or Kano Jujutsu in Brazil. Later his students would develop what is now known as Brazilian Jiu-Jitsu. Maeda taught his Kodokan Judo, blended with some catch wrestling he had learned while traveling Europe, to several students in Brazil, most famously Carlos Gracie. One of Maeda’s first students was Luis Franca, a man who sadly little is written. In 1937, Franca took a student of his own, and while Helio Gracie was learning Jiu-Jitsu for the first time so was young Oswaldo Fadda. Fadda would earn his black belt in 1942 and began to given lessons on the outskirts of Rio. By this time the Gracie family had the made the martial art of Jiu-Jitsu well known but many of their prices for instruction were steep and Gracie Jiu-Jitsu was a martial art of the middle and upper class. Fadda taught his lessons in public areas, opening techniques to lower classes for no charge. Helio invited Fadda and his students to a competition at the Gracie Academy. Fadda’s students defeated Helio’s, many of them using foot locks though one Fadda student did choke a Gracie student unconscious. While the Gracie’s scoffed at the use of footlocks, referring to it as a “suburban technique”, they declared Fadda’s victory as a sign that Jiu-Jitsu belonged to everyone. The Globo covered the event and gave Fadda excellent press and new students flocked to his academy, as well as tough man challengers. Over the years Fadda and his students defeated all comers. 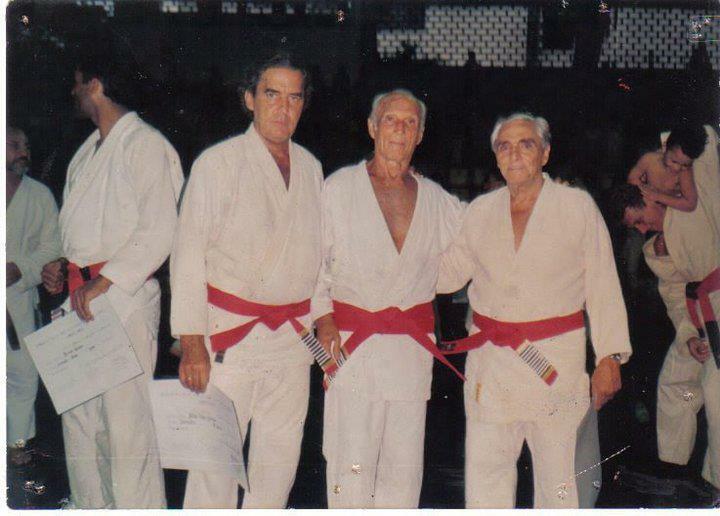 Fadda would earn the fabled 9th degree rank of red belt, the highest honor bestowed to a non-Gracie. In 1951, famous judoka Masahiko Kimura defeated Gracie in a submission judo/jiujitsu match held in Brazil. During the fight, Kimura threw Gracie repeatedly with ippon seoi nage (one point back carry throw) and osoto gari (major outer reap, Kimura’s signature throw). He threw Gracie three times with osoto gari, ouchi gari (major inner reap), uchi mata (inner thigh throw), and harai goshi (sweeping hip). Kimura reportedly threw Gracie repeatedly in an unsuccessful effort to knock him unconscious; Kimura later claimed that the reason for his lack of success was the excessive softness of the mat. Kimura also inflicted painful, suffocating grappling techniques on Gracie such as kuzure-kamishiho-gatame (modified upper four corner hold), kesa gatame (scarf hold), and sankaku jime (triangle choke). Kimura was, however, unable to make Gracie submit even though he had claimed in the press that he would finish the fight with the first grip. Kimura also claimed that if Gracie could survive three minutes, he should consider himself a winner; the fight lasted 13 minutes. Finally, thirteen minutes into the bout, Kimura positioned himself to apply a reverse ude garami (arm entanglement, a shoulderlock). Gracie refused to submit. 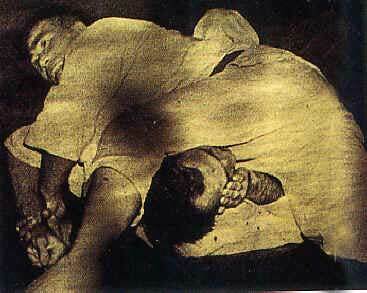 At this point, Carlos Gracie interrupted the match. In 1994, Gracie admitted in an interview that he had in fact been choked unconscious earlier in the match, but had regained consciousness when Kimura released the choke. As a tribute to Kimura’s victory, the reverse ude garami technique was named as the ‘Kimura lock,’ or simply the ‘Kimura,’ in Brazilian Jiu-Jitsu. · 1935: Submitted Dudu by Side Kick to the spleen. Royce Gracie followed in the footsteps of Grandmaster Helio and ingnited the Gracie Jiu- Jitsu craze worldwide in the early 1990’s. By winning the first two Ultimate Fighting Championships in dominating fashion, Royce proved to the world that Gracie Jiu Jitsu was undoubtedly the single most effective fighting style. There was simply no answer for the simple techniques of Royce Gracie. The necessity for ground fighting was realized by fighters all over the world. Now Brazilian “Gracie” style Jiu Jitsu is a cornerstone in the sport of mixed martial arts. Through the natural process of evolution the art is still changing and adapting. This is the essence of BJJ. New techniques are being developed, tested, discarded, and proven everyday, somewhere across the globe. PREZADO AMIGO PROFESSOR JOSH GOSTEI MUITO DO SEU SITE. PARABÉNS ! UM ABRAÇO !